There are two books I recently read which inspired me and those books are Logo Design Love and Work for Money, Design for Love both by David Airey. When I read the down to earth tone of the book I really enjoyed it. It felt like I was speaking with someone in the same room and they were just sharing their thoughts with me. The book is minimal but also graphically sound, which is expected because David is a graphic designer. Another thing I noticed about the books is David used storytelling from his 10 years of experience as a designer. Here I was thinking to write a book my writing skills needed to be on the same level as Seth Godin, John Maxwell or Tom Clancy but all I really needed was to organize my thoughts around a central subject. That is when I decided I will write a book about my successes and failures in starting my own freelance business. At that point I sat down and wrote out everything I could remember about starting my business from formulating my business structure, to getting my first client, balancing my accounting and submitting my taxes. I wrote down everything that I could think of. At this point I had a decent idea but simply writing out my story seemed to be a long narrative that people may not be interested in. This lead me to think ways to narrow down the topics I plan to discuss in the book. I stumbled across Nathan Barry’s website. Honestly I do not even remember how I discovered it, but when I did I noticed we had similar thoughts about marketing, design and business. I must have read through all of his articles in a day it seemed. He also authored a book called Authority and once I purchased the book I could not put it down. In the midst of work and client projects I still managed to read the book in 7 days. The book is a PDF so I was able to read it at home on my computer or on my mobile device every chance I got. After reading this book I was able to narrow down the wide list of topics I wrote out earlier. In the midst of writing all of my thoughts I realized on the front end of starting my business I would come home from work and devote the rest of the evening to researching all it takes to start a business. I thought to myself “I wish I had someone to quickly walk me through the essentials of starting a business so I could have saved time”. With that thought I had my idea, I wanted to write a book where I could advise others how to quickly begin a business and avoid common pitfalls. 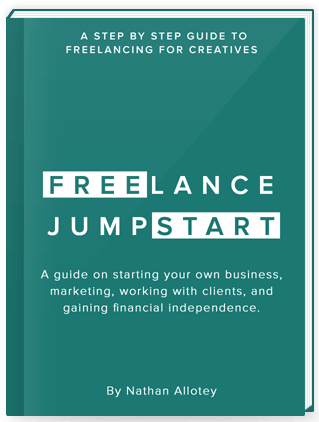 I have decided on a title of the book it will be called Freelance Jumpstart. This title has a double meaning when you see the cover of the book I designed you will notice that it is stylized a certain way. Not only do I want to help freelancers jumpstart their business but I want to show them how they can have a free start by taking advantage of all the free business help and tools out there. I tend to do this in some of the designs I create, I like the thought of delivering two messages in one but staying within the central meaning of the original message. I used this concept in the past when developing the branding for Mannafest. I am in the process of writing the book and organizing how I would like to lay it out. Of course if there is anything you would like me to cover in the book contact me and I will be more than happy to add it.